A challenge that happens 4 times a year with a break between sessions. Round 1 starts January 3, 2011 (because I like starting things on Monday and this way everyone can recover from New Year’s excesses) and runs through March 24th. (Round 2 would start April 4, Round 3 July 4–okay maybe rethink that–, Round 4 Oct 3–you get the idea). Once Sign-Ups are open, you’ll make a blog post stating your measurable goal and swing by here to link to it in the Linky Tools list. If your goal changes because you’ve met it before the 80 days is up, just write a new one and link to it on a check in day. There will be twice a week check-ins on Sunday and Wednesday where you’ll update us via the same method. The idea here is that folks can travel around to everybody’s blogs and drop a supportive comment. We’re contemplating dividing into teams under each of the sponsors so that everyone has a manageable list of folks to visit once a week. 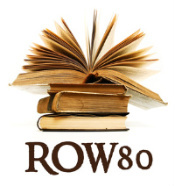 On Twitter we’ll use a hashtag of #ROW80 so everyone can follow discussions (though if you’re not on Twitter, that’s totally fine too). Okay i’ve joined. I’ll think about my goals. Oh yay! I’ll be sure to read your updates each week.